Hallelujah, Amen. Football season is finally here! A few friends and family members came over to my house today to partake in this glorious moment we’ve all been awaiting. I wanted to make a mimosa bar, but since most people were coming later in the day to watch the evening games, I had to get creative. The fruits and juices all look so pretty and make for fresh and yummy drinks, so then I thought, “What if I just use vodka instead of champagne and make a screwdriver bar?” So this, my friends, is what I’m calling the Fruity Screwy Vodka Bar. I love the vintage look of mixing different pitchers and vases and glasses that you already have rather than going out and buying things to be matchy-matchy, but I needed a way to distinguish the juices. Luckily, I found these handy chalkboard stickers at World Market. They were $3.99 for a six-pack and the chalk erases easily with a slightly damp rag. 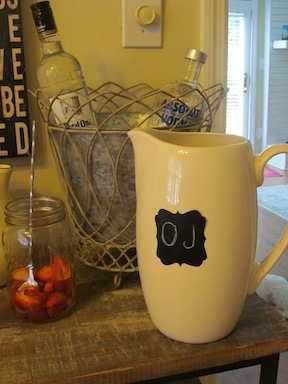 I thought about buying carafes, but there’s no need when you can simply put a sticker on a pretty pitcher you already have then pull it off when you’re done with it. My lovely friend Wendy Bunch sent me a beautiful bouquet of flowers last Saturday and most of them are still in great shape, so I decided to make a bouquet of my favorites. I like to make things as simple as possible on game day because, let’s face it, with everything else going on, who wants to hand squeeze a dozen oranges and grapefruits? So I bought a jug of Simply Orange, a jug of Simply Grapefruit and a small bottle of Simply Cranberry Cocktail to add for a splash of cranberry flavor. I bought fresh strawberries and pineapple and cut them up into drink-sized pieces. I also cut up limes and put cans of LaCroix in the ice bucket for those who wanted to make vodka soda drinks. These champagne glasses were given to me by my late great-grandmother, Mamie, and are perfect for those wanting to do a “taste test” and get little doses of different flavors. But I realize they are a little small, so I put the drink glasses my Mamacita passed down to me on the second shelf of my bar for those who wanted a larger sipper. The beauty of the Fruity Screwy Vodka Bar is that you aren’t in charge of making everyone’s drinks, nor do you run the risk of not making it just the way they want it. With the bar, guests can put whatever fruits they want into their drinks, mix or choose whichever mixer they want, and add as much or as little vodka as they like. Not to mention, it looks great! 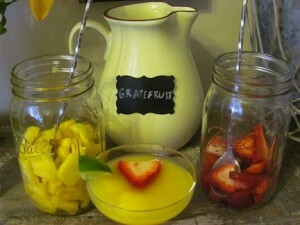 We at PrettySouthern.com also recommend these Mason Jar Wine Glasses for the perfect game day goblet. Cute idea!! Who doesn’t love a screwdriver on gameday! I’ve seen tutorials on Pinterest for the chalk labels, but good to know World Market sells them.